How Long Are Your Possessions Supposed to Last? Taking care of your stuff tends to make it last longer, but eventually, most things wear out and need to be replaced. That's not a big deal when it's something relatively inexpensive like a pair of sneakers, but it can be a VERY big deal, when it's something major, like your refrigerator or your car's transmission, and you haven't planned for the expense. That kind of unexpected expense is enough to wreck your budget for months or to send you spiraling into debt. But it's not like you can predict when something's going to break, right? You see, while you can't predict the exact day your washing machine is going to give out, you can use the typical life expectancy of a washing machine to predict how long you have to save for a replacement, so the money is there when you need it. And that's a very powerful thing. Instead of sweating how you're going to pay for a new washing machine, you can focus on picking out the right washing machine. Then, let's look at the typical life expectancy of several big-ticket items, so you can start saving up. Many of the refrigerators that were made from the 1920s to the 1950s are still running today. 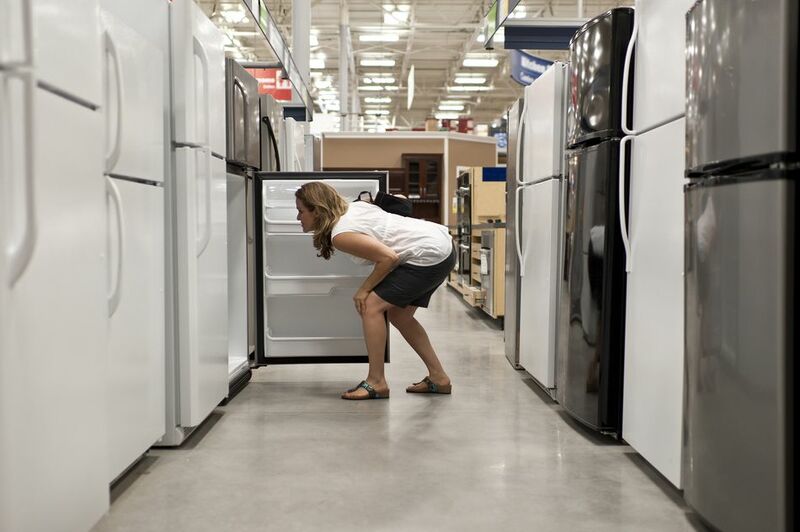 Unfortunately, the life expectancy of a fridge has gone down quite a bit since then. You can expect to get 9 to 13 years out of a modern refrigerator. Want to squeeze extra years out of your fridge? Then, opt for a model without all the bells and whistles. Less working parts means less to break, and cheaper, easier repairs. You can also extend the life of your refrigerator by performing these simple maintenance tasks quarterly. A modern electric range is usually good for 13 to 15 years of service, while a gas oven is good for 10 to 18 years, and a gas stove is good for 15 to 17 years. Of course, If you never cook, your stove could last you a lifetime. A lot of it depends on your usage habits. Want to buy one stove and be done with it? Consider purchasing a vintage stove. Since there aren't any computer components involved, they're easy to work on. The parts are also surprisingly cheap and easy to come by. Your dishwasher should relieve you from dish-washing duty for 9 years. To squeeze more years out of your dishwasher, and keep it cleaning as well as the day you bought it, give it 15 minutes of TLC every few months. Here's what you need to do to keep it going strong. Expect to get 5-15 years out of your current washing machine. That's down three years from a decade ago. Blame it on all the steel parts that have been replaced with plastic. Your dryer should last you around 13 years. Before you replace a broken washer or dryer, see if a repair is possible. Many of the parts are inexpensive, and some are easy to swap out yourself. If you have an older machine, (i.e. one that was made before the world turned plastic), definitely pursue repairing it. You just won't find the same quality in a newer machine. And of course, as with all appliances, cleaning your washer and dryer periodically will greatly improve its performance and life. Plan on three years; hope for four, and don’t push past five years. That's a good rule of thumb, but it doesn't mean you can't squeeze a 6th (or even a 7th) year out of your laptop or desktop if it's still working for you. So, save enough to be able to buy a new computer at the three-year mark, but keep using your computer as long as you're happy with it. TVs use a lot less energy nowadays, but they also have a much shorter lifespan. Expect to get 4-10 years out of an LCD/LED TV and three years out of a plasma TV. To stretch your time between TVs, opt for a big name brand (which will use better parts), and position your TV away from heat sources, like windows or a fireplace. A traditional tank hot water heater has a life expectancy of 6-12 years; a tankless hot water heater can last 20 years. Draining the sediment from your tank once a year (twice if you have hard water) is also a smart move. It'll ensure that your water heater doesn't have to work any harder than it supposed to heat your water. Have a tankless water heater? Hire a plumber to flush the system once a year. Want to go longer between new roofs? Then, consider upgrading to a longer-lasting roofing material the next time you need to replace your roof. Most drivers keep their cars for around six years, but R.L. Polk, the company behind CarFax, found that the average age of vehicles on the road today is 11.4 years. That's great news if you don't like to spend money. Just keep up with regular maintenance; set aside some money for repairs, and there's no reason you can't meet or beat the average. Tires - Expect to get 50,000 miles out of the tires on a new car and comparable replacements, but keep in mind that the brand you buy, their rating and your driving habits may affect how many miles you actually get. Tires should be replaced after 10 years, even if they have good tread. Timing Belt - If you're driving a car that's old enough to have a timing belt, plan on replacing it every 60,000 miles. Waiting for it to snap could cause engine damage. If your car has a timing chain, it doesn't need to be replaced until it affects performance. Brake Pads - How long you'll get out of a set of pads depends on what type of brakes your vehicle has (disc or drum), the quality of your current pads and how you drive, but you can expect to replace your brake pads somewhere between the 20,000 and 50,000 marks. Waiting too long can lead to more costly repairs (and put your safety at risk), so you definitely need to stay on top of this task. Serious about keeping your vehicle on the road for the long haul? Then, choose a brand with a reputation for longevity.